Ogemdi Ike is a banker. 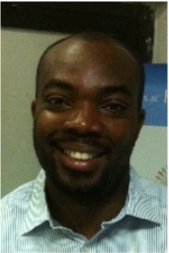 He has worked in various banks in corporate Nigeria. While he enjoys and appreciates his job as a banker by day, at night he indulges in his passion, which is writing, weaving tales of contemporary crime stories in Nigeria. Ogemdi believes that when you follow your dreams and make your hobby a job, then you will never have to work a day in your life. He lives in Lagos and is currently working on his second novel. Inside Banker, the first novel by Ogemdi Ike, is a fascinating glimpse into the lives of the typical Nigerian banker. Imagine a bank’s branch waking up to the reality that a massive fraud has been committed, and the masterminds behind the crime most probably within its ranks. Will a dark secret prevent Nene, the branch’s Operations Manager and the most liable banker from proclaiming her innocence? They say the simplest solution often solves the most complex of problems. Will that be the case when Tonye the branch’s resident auditor is pitched against the perfect crime? If you enjoy real life crime stories especially the seemingly irresolvable kind, this is the book for you. It is hard to believe but in Lagos alone crimes like these go on in its seemingly respectable banks. IB is a humorous look at white-collar crime in contemporary Nigeria, a fast-paced novel sprinkled with some romance, a dash of raw erotica and of course a nail biting fraud investigation. It’s a tale that will take you on a journey and keep you guessing , your mind racing till the very last page begging the question- Will the inside man be found out or should I say …the inside banker.